If you can’t see you can’t ski. Good protection from the sun and elements is essential in order to climb and descend safely. Make sure to bring a headlamp for the dawn patrols and late skis when you might be returning in the dark. Finally, some goggles that work for uphill skiing. Julbo has an ingeniously simple plan for tackling the inevitable fogging that occurs if you ski with a typical goggle in the backcountry. All you do is pull the lens away from your face, which pops open to leave a sub-centimeter gap all around the glass. This is just enough to let your steam escape and a freshening airflow to work ..
Now the award-winning SuperFlow system is available in a more affordable goggle. The Airflux sports the same amazing ventilation found in the Aerospace, but without the chromatic lenses. Instead the goggles are fitted with an assortment of Julbo Spectron lenses, each adept in different lighting conditions. If you’re headed uphill to ski, pop the lens away from your face with a simp.. Sunglasses work fine for most fair-weather backcountry skiing thanks to the superior airflow and venting while skinning. When the weather rolls in or the powder gets deep, goggles step in with extra protection. The issue with goggles is that when skinning they turn into a fishbowl of fog, sweat, and humidity, rendering them useless. Julbo took note of skiers’ demands for a goggle d.. The Julbo Aero is the high-performance optic of choice for mountain athletes the world over. No frame or lens detail was overlooked. The lens sits suspended within the frame to create a small gap perfectly sized for massive amounts of ventilation even at low speeds. The wrapping lens combats distortion and ensures crystal clear protection from the elements. The 3D Fit Nose piece an.. Your face is the most common place to forget the Julbo Aerolites. Built on the same platform as the Aero, the Aerolite is an equally high-performance optic, only slightly narrower and even lighter. A rimless lens design paired with massive ventilation cutouts on the sides come together to form a pair of glasses so light you’ll forget they're on your face while frantically searching..
Gloworm is a New Zealand company making high-end LED lights. The more light you have the faster you can ski since you have more time to react to whats coming at you. With Gloworm's Alpha and X2 headlamps you can get all the light you need at the press of a button. 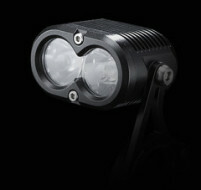 Alpha - 1200 Lumens - The kit includes 2 interchangable optics: Spot/Flood, and Spot/Wide. There are also 2 programm.. The new Petzl Bindi puts the power of 200 lumens in the palm of your hands. Actually make that around your head, since it’s a headlamp. Or neck, because it’s also a necklace? That’s right, you can wear the Bindi around your neck and still have it point out and illuminate your general direction. With an ultralight, 35-gram weight, the Bindi is the perfect backup or emergency headlam.. The original Tikka from Petzl is back. Just as small and light as before but now with more lighting power. In an 88 gram package with 3 settings plus a red light, this little guy will keep your life lit up before the sun comes up (or after it goes down!). The Tikka is a great to keep in the car so you don’t forget it when you’re groggily preparing for a dawn patrol. At 200 lumens i.. The e+LITE headlamp from Petzl is perfect for those adventures which you don't expect to need or want a headlamp, but are smart enough to never go without. Chock full of features, the e+LITE weighs just 26 grams (0.9 ounces). Stuff it in your pack and forget about it. Just remember you have it when you’re caught out! Included carrying case disappears into virtually any pocket..
Gloworm accesories available to upgrade or add to your existing setup. Other parts available upon request. Headstrap - Simple strap that fits on a head or helmet with a go-pro style mount quick mount incorporated. 2900mAh Battery - Replacement battery for all Gloworm lights. Also available in 5800mAh and 6800mAh versions. Li-Ion Charger - Replacement adapter for your Glowo.. Need a backup battery? Replacement head strap? 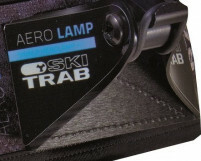 Find accessories for the Ski Trab headlamps here. Aero Head Strap – The headband with Velcro onto which you can attach a lamp. Helmet Support – The tripod that mounts to a helmet to support an Aero lamp. 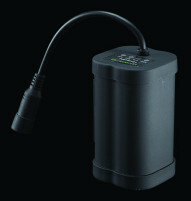 7.4V Battery Packs – Two and four cell packs for use with the 400 and 1600 lumen lamps. 7.4V Battery Charger – A/C adapto..